I haven’t posted in a very long time – please accept my apologies. I’ll try to do better. 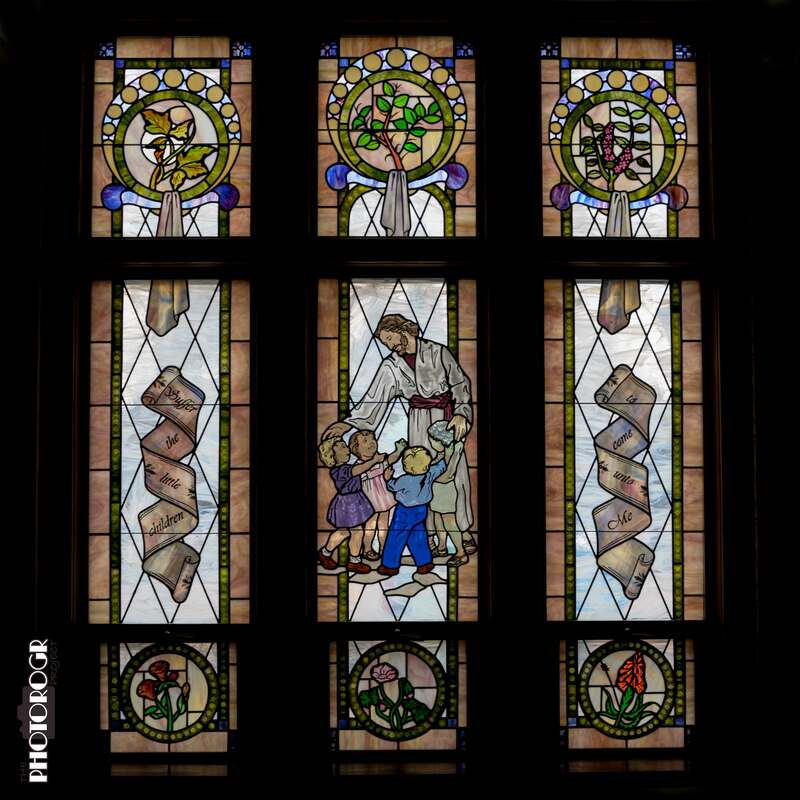 For my triumphant return, I spent some time in the First Presbyterian Church photographing the stained glass windows. This is my home Church, where I was baptized, attended Sunday School, received the Eagle Scout rank, married, and baptized my children. I’ve always loved these windows, so I picked up a book about them to be able to share what they represent. While studying for my God and Country Medal, I learned the meanings of the windows but welcomed the book because, well, I earned my God and Country Medal over 45 years ago. This window is in the Foyer. The left panel shows the figure of St. Paul, with several symbols from Ireland. The right panel has the figure of John Knox, with many symbols of Scotland. Across the top (left to right) are the Fish and Anchor (symbol of Christ), the Seal of the Presbyterian Assembly of Ireland, the Seal of the General Assembly of the Presbyterian Church in the U.S.A., and the Cross and Orb (symbolic of the world conquest by his gospel). This window was dedicated in 1957. The Chapel has always been my favorite room in the Church. 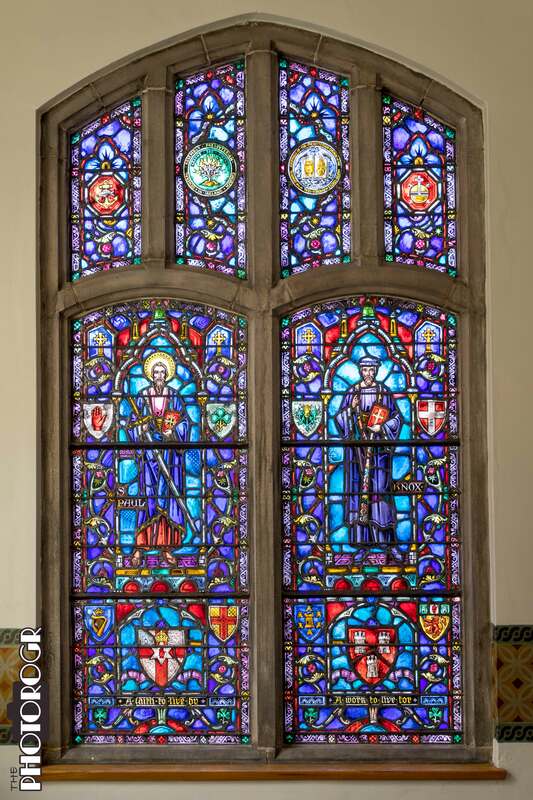 This is the North Window, in Loving Memory of Lt. Col. Archer S. Freund, killed in Germany in 1946, and was presented by his Mother, Mrs. Edwin P. Taylor. 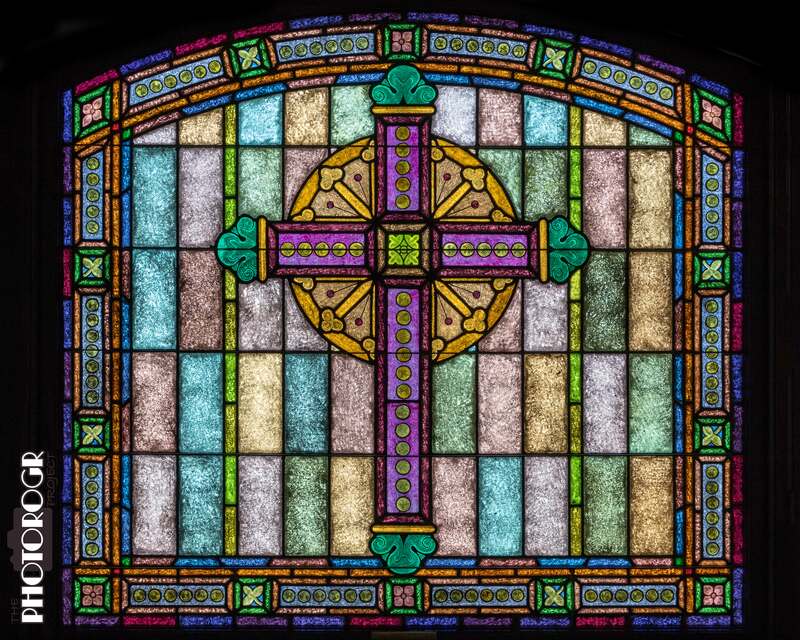 This window is behind the alter table in the Chapel, and is the main focal point of the room. Beautiful Roger!! Happy Easter to you and your Dad. We miss you and can’t wait for you both to come home. Happy birthday (on Sat.) to you also!! Hope you are able to take a little time and celebrate. Absolutely stunning windows with so many memories. Look forward to seeing you and your Dad.